(Nanowerk News) Still think concrete is a lumpy, coarse and dreary material? It's time to think again. 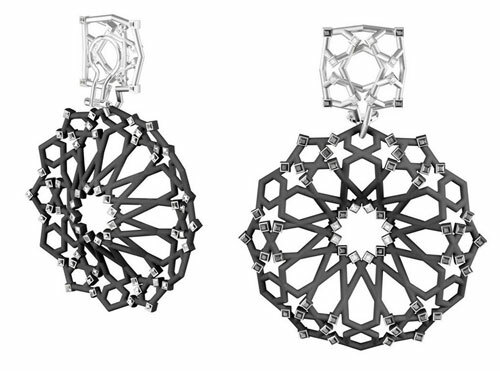 Viennese jeweller Thomas Hauser uses a special sprayed concrete mix developed at the Vienna University of Technology to make his ornate jewellery. 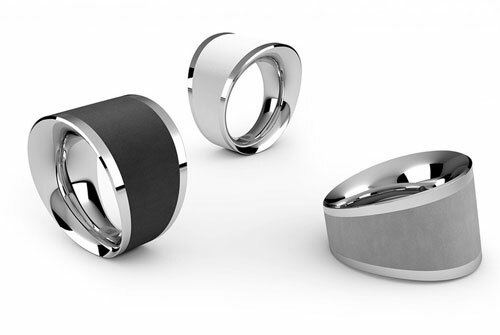 He has been awarded the internationally renowned Red Dot Design Award for his 3-ring "AAA" concept made of concrete and palladium. "Noble concrete" is what Thomas Hauser calls the material composition he uses for his jewellery creations. "Concrete has incredibly beautiful aesthetics. As a material it can do a lot more than you would think," he says. The first step involves making the main body out of precious palladium metal, before various shades of concrete are added to the design as a second step. "We don't want to lose the distinctive visual appearance of the material. It must not be corrupted but made sure that people still recognize it as concrete. At the same time, the aim is to create attractive and appealing designs – striking this balance is the exciting artistic challenge that we face," explains Thomas Hauser. All this has been made possible by a special new mix of concrete developed at the Vienna University of Technology. It is here that construction engineer Johannes Kirnbauer adapts concrete mixes to meet a range of different technical requirements. Depending on the size of the individual particles in the concrete, the material will have different physical properties and a different visual appearance. "One major challenge we faced was getting the viscosity of the concrete right," comments Johannes Kirnbauer. "It needs to be sufficiently low viscosity to flow well, but also viscous enough to ensure that a sufficiently solid layer adheres to the ring." The concrete block that is sprayed on in several layers is only slightly more than one millimetre thick. The concrete is then glazed and polished at the end of the process. A string of experiments are needed to get the mix of concrete right – a process that is aided by computer simulations. "Many people think that concrete jewellery must be really heavy, but actually it's quite the opposite," says Thomas Hauser. Concrete weighs about 2.3 grams per cubic centimetre – the same volume of gold weighs more than seven times this amount. This means that larger jewellery designs can be made from "noble concrete" too. Thomas Hauser's ornate concrete creations have now won him the internationally renowned Red Dot Design Award. This year's competition saw 4662 products from 54 countries entered. In the watches and jewellery category, remarkably , the prize has been awarded to Thomas Hauser's ATELIER ALLURE for the third time in succession. "The jury took a close look and avoided being dazzled by just the bling, and instead looked beyond the sparkle and glitter and used their eyes and hands to look for quality in the jewellery," says Thomas Hauser. The prizegiving ceremony is scheduled to take place in Essen, Germany, on 1 July.